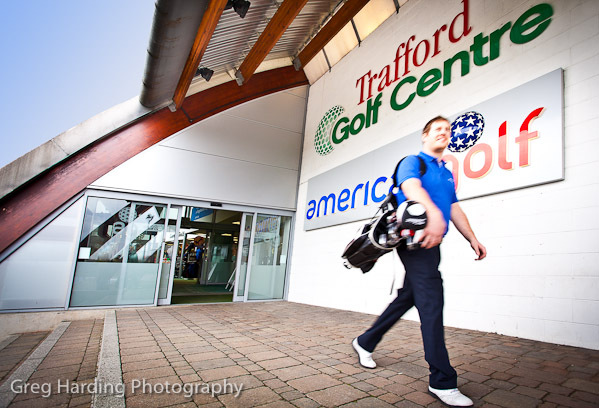 A while ago I was approached by Pete Styles – Director of Golf at the newly re-branded Trafford Golf Centre. The golf centre is now owned and co-managed by Peel Holdings and since the rebrand the new centre has been looking to update its marketing images to attract new clients and to increase the traffic to their website. 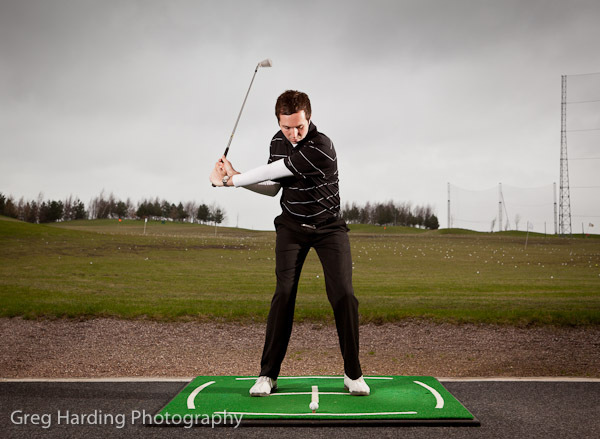 Being a regular visitor to the driving range I was aware of what the centre offer golfers and being a commercial photographer I’d already been thinking about what images I could create using the range as a photography location. I find it hard to switch off my creative pre-visualisation, even when I’m supposed to be practicing my golf swing. So when I was approached with the idea of creating images for the centre, I had a pretty clear idea of what I could do to highlight the centres excellent training and practice facilities. The original business owners (Playgolf TM) owned the existing marketing images and they were pretty heavily branded with the old logo so they couldn’t be used anyway. The majority of the shoot list involved capturing images that conveyed the message of new ownership and highlighting the new branding logo. I was confident that i could get the centre what they needed, but I was less than confident about the weather. It was February and in Manchester, unfortunately there was no negotiating to come back in the summer, they needed new images asap. So with fingers crossed, we chose a day clear for both of us and hoped. Of course being Manchester, the weather on the day of the shoot was dismal and generally speaking if we’d had any choice I would have advised re-scheduling, but the shots were essential for the new site launch and the marketing team at Peel were very keen to get something they could use without delay. Being a location photographer the most challenging part of a shoot is crafting light to fit a certain look and feel. Capturing the pros swing sequence was perhaps the most technical part of the shoot. This involved a 2 light set-up, but the trick here would be to darken the background ambient light to help the pros stand out. Using the teaching bays I positioned the pros so they had their backs to the range. The ambient exterior was metered and then Elinchrom Quadra heads were set to overpower the ambient level by 2 stops. Setting the camera to the more intense studio flash value would have the desired effect of darkening the background ambient light and provide a crisp punch of studio flash light for the swings. Trafford Golf had previously used a photographer that wasn’t experienced in photographing golfers, this might not appear immediately important. But when you’re shooting a professional golfer swinging a club, both the path and position of the club/head through the swing plane is critical. Especially so if you’re using the images as a demonstration aid later. The last thing you need is to be criticised by rival golf pros for showing poor technique. They must look ‘text-book’ perfect. This is actually good advice for any business looking to engage a photographer. Make sure the photographer you’re thinking of using has experience of your business sector. Ask them what they know about your business. You’ll soon find out if they’re the right photographer for you, they should also be able to provide you with some examples of their work in your sector. Don’t trust your business image to a cheap hopeful. You will regret it. Fortunately I’ve worked with Pete on other golf projects and being a golfer myself was a huge advantage in this circumstance. Click on the image below to see a typical swing sequence photo gallery, this particular sequence is provided by the uber smooth swinging golf professional Rick Shiels. The new Trafford Golf Centre website is set to launch very soon so I’ll post an update when it’s gone live, but for now thanks for checking out the latest blog post. If you’re into sports photography you may also like to see my shoot with Laura Massaro.